A duty sergeant would be responsible for waking buglers up to sound the first calls in the morning. This usually involved having the bugler tie a towel at the foot of the bed so the sergeant would know who to wake up. A favorite anecdote had him hearing some loud noises early one morning and thinking he had missed his wake up grabbed his bugle and ran to the parade field sound Reveille. He played that familiar signal into the large bugle megaphone set on the field.Â He said it was a thrill to see the lights going on all around him until he found out it was 0330. The next morning found him watching in horror as the skies filled with enemy planes and black smoke rising from burning ships in the harbor. He spent the next two days carrying messages between headquarters and air fields. Real hero-Thanks for your service!! 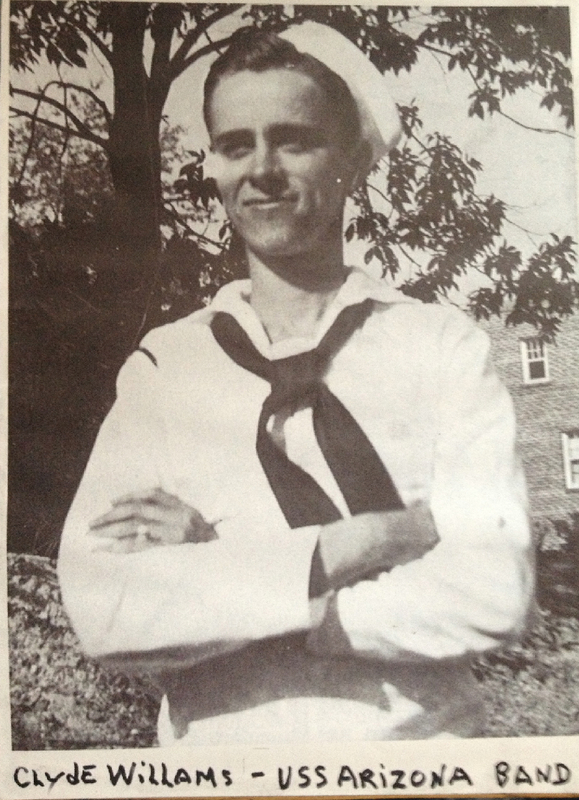 Â Allen Bodenlos, Bugle Master and Pearl Harbor Survivor passed away on November 17, 2014 at the VA Medical Center in San Diego of complications from pneumonia. He was President of his chapter of the Pearl Harbor Survivor Association and a frequent speaker and volunteer up until his final weeks at the age of 94. 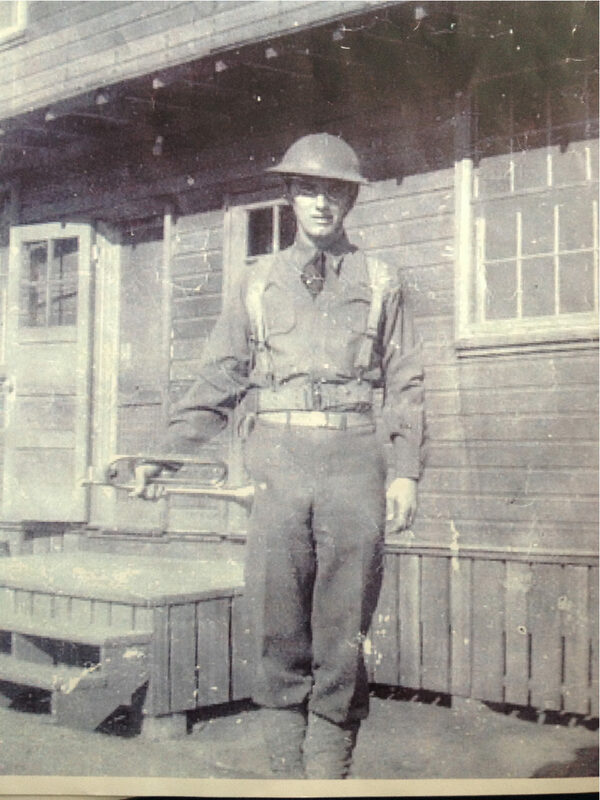 This entry was posted on Saturday, December 3rd, 2016 at 6:00 pm	and is filed under Bugle Stories, Buglers Through History, General Interest, History of Taps, History of the Bugle, News. You can follow any responses to this entry through the RSS 2.0 feed. You can leave a response, or trackback from your own site. My wife and I met Mr. Bodenlos on Oahu. I can’t remember the exact date; but it was early December, 2013. We were attending a luau and Mr. Bodenlos was present and was honored that evening before the show started. Prior to dinner being served we approached Mr. Bolendos and introduced ourselves. We just wanted to meet him! He was very gracious and spoke to us for many precious minutes, as there were MANY people waiting to meet him. I always carry a small travel journal and I requested if he might sign it, which he did, “Al Bodenlos 804th ENGRS 7th Air Corps Dec 7, 1941”. It was such a treat to meet him. He was an amazing man. A special memory that we will always cherish. My husband Randy and I had the pleasure of meeting Allen in June of 2010 at Pearl Harbor. I told him we were there to pay respects to my mom’s friend and classmate who died and is still on the Arizona. Her health didn’t allow her to ever visit, so we went and left flowers for Tom Lounsbury. We met Allen outside the gift shop telling his story. I was saddened by the amount of ‘survivors guilt’ he talked to us about. When he was finished I asked if I could give him a hug? He told me at his age he never turned down a hug from a pretty girl. I thanked him for his service and for continuing to tell his story. I have saved the copy of his story and want to make sure his story is still being told. I am an employee at the VA Medical Center and had the pleasure of speaking with Allen many times. A couple of years ago I took my son to the Veterans Day parade and he was able to meet Allen. Allen volunteered at the VA Medical Center for more than 20 years. There are still many people that ask where Allen is when they pass by the welcome center. I will always remember this tiny hero that still volunteered for we the younger veterans at the VA La Jolla Medical Center. 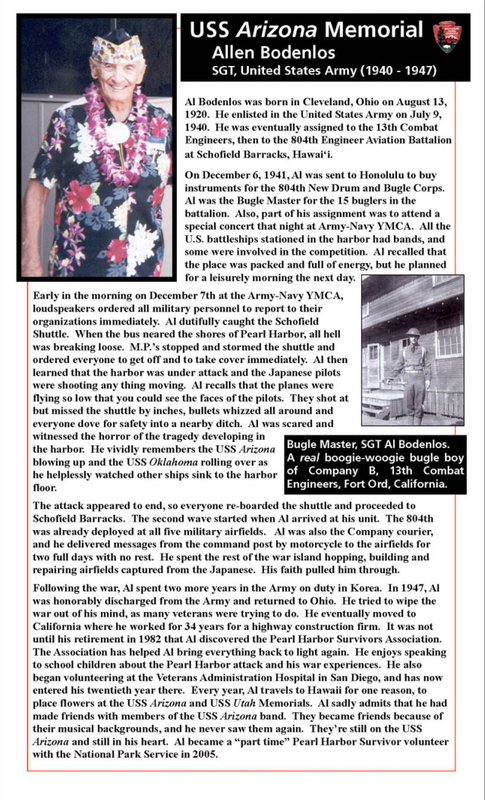 I spoke with him frequently about my family who had been at Pearl Harbor – an uncle at Hickham Field, another at Ford Island and my still living great auntie who lived on Aiea Hts and witnessed the entire attack from the hills above Pearl Harbor. She wrote about it in her published memoir. I know Al is with all his buddies now and he is happy! I mate Alan in the late 1998 or some where in that time frame. I was at the VA Lajolla on Pearl Harbor day in the chapel while I was waiting for my friend appt in area one. In waiting it was announced that a program of Perl Habor in the chapel and all is welcome. I looked to my friend is ask if it is ok with you I would love to attend this event. As soon as he said sure I was there front and center. This was a very rewarding experience. After that part of the program of hearing Al. Tell his story it was heart touching. I found my way on stage to tall to this great,man and speaker of this event of Pearl Harbor He had a lot of things that he showed of The Attack of Pearl Habor Attack. I shared with Mr. Allen Bodenlos of my thanks for his sharing and had the pleasures of taking a few picture with him and his many treasures. What a blessing. Between six or eight years later I share those pictures with this wonderful and kind man and just to see his face light up was joy to my soul. Every year that Al went to his reunion he will all ways bring me back a Latin pin. 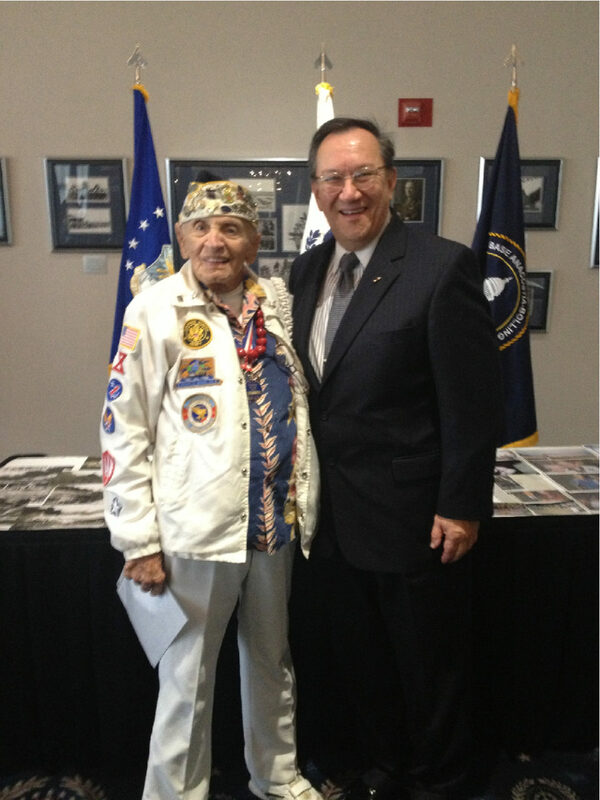 Working at The VA Valuteer Service with Mr Allen Bodenlos Bugles Mastet is a very highly honor. So in closing I want to say thank you Allen Bodenlos for all of your service!! Mister Bodenlos was born in 1920, not ’26. 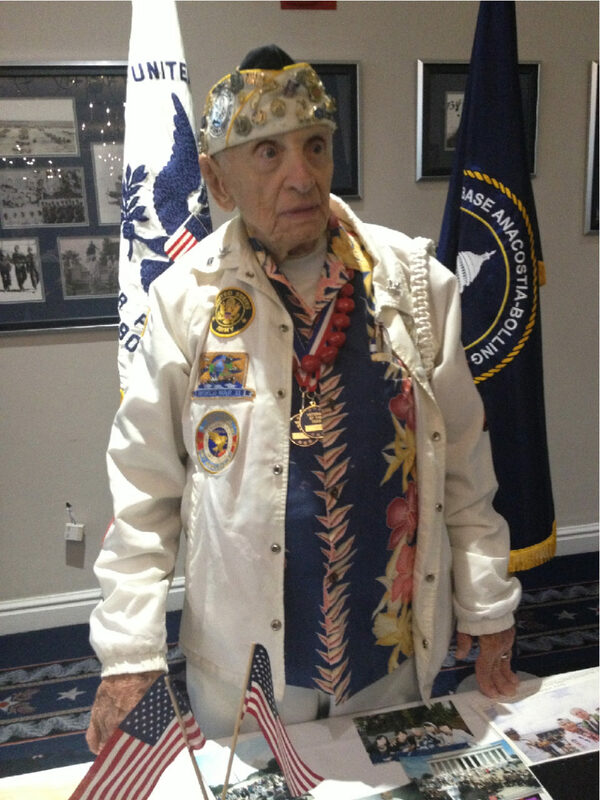 He was 94ywars old this year and sadly passed away yesterday at the VA Medical Center in San Diego. He will be missed and fondly remembered by many.